Managing your time as an adult will always be a constant struggle, but being a parent and managing your time adds an extra weight. Being a parent and having a career will mean juggling two consuming and demanding jobs. I am going to share tips on how to organize your time and nurture a strong, happy family dynamic. The chaos may be unavoidable, but you can learn how to maximize the time you have and make the most of those precious minutes with your family. Read about how you can assess your time, maximize your potential, and how to raise a child who manages their time well, thus paving the path for success. 1) As a parent you not only have to Review and Measure Your Time, but you have to make sure you account for getting kids prepped, cleaned up, travel time and more! 2) To Do List! This is a must for me! Put pen to paper and write down everything you have to do for the week, or day, and let that help you manage your time. If you have to leave the house for multiple things, plan accordingly so you have time to finish them all, or get them all done at once. 3) Along with the to do list, is the calendar. Calendar’s help everyone! Knowing where your family is and how long they will be there, will make it easier when planning your time. “Use a different colored marker for each person’s appointments, parties, lessons, and activities (Mezey, 2010).” Review the schedule together opening up discussions about the schedule and any discretion. 4) Knowing how to Pick Your Battles and Asking For Help can both be daunting tasks. I am not saying you cave to your child’s every whim, but you have to choose what you can live with versus what drives you insane. Think you are losing your sanity? Don’t be afraid to ask for help! You do not have to do everything! Recruit, delegate, let others he lp you get it done! 5) There are endless tips, but the most important is to remember to Recharge Your Batteries. 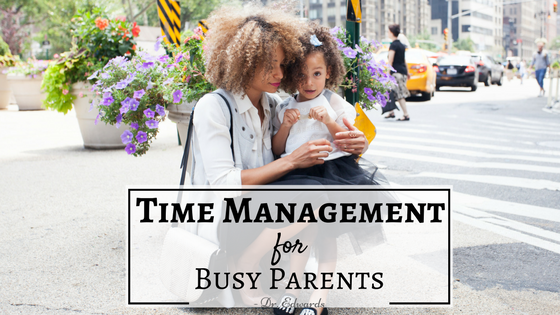 In managing your time, your spouses time and your children’s time, carve out alone time. Everyone needs a break from the day to day crazy. The only way you can manage your time successfully, is to manage to allocate time for yourself. 6) Creating a Calm and Quiet Space helps your child focus on one task at a time. Depending on their age you can fill it with age appropriate toys or a desk for study time. 7) Display and help curate Self-Discipline and therefore time management. If you help your child write down what they need to get done and then go over step by step how to do it, let them execute it and then try the whole process on their own the next day. Depending on your child’s age you can give them the responsibility of managing projects or remembering to do daily life routines on their own. Encourage them by practicing self-discipline yourself. 8) Don’t forget BEDTIME! This is not just for the children. Getting to bed at a decent hour makes the next day so much smoother. Waking up rested and ready for the day will help avoid the vicious cycle of poor attention and chronic lack of energy to complete tasks. When you construct household routines, and everyone continues to play a role, you give your children valuable tools. Learning to work as part of a team, fulfill goals, and take responsibility will help pave the path to success in life.